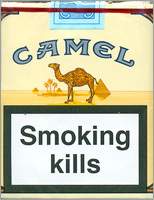 The rebranding strategy in 2005 made some people believed that the original taste of Camel cigarettes was dead and buried. However, the evidence proves that such an assumption was false. This article explains why the new packs of Camel still preserve the original formula, how they do it, and to what extent. Basically there's no significant difference between the new Camel Filters and the old Camel. In 2005, the company operated modification, but only in the overall design and in filters, and they left the original formula unchanged. The same mixture of Turkish and Virginia tobaccos is to be found in this variety. Same goes for Camel Non Filters and Camel Mild. Light varieties are meant to offer a similar (yet not identical) taste but a reduced quantity of nicotine and tar. As such, Camel Blue, Camel One, Camel Black Super Slims, etc. don't have a perfectly identical taste, but are still very close to the original taste. You can enjoy these types if you want to experience a soft note of the original taste and take advantage of a lighter, less harmful cigarette. Smokers don't usually like changes. Moreover, the idea that the Camel taste may have been lost seemed completely preposterous to many people around the world. Even so, one must understand that rebranding is compulsory because any brand, however brilliant may have initially been, grows old. Camel was rather an exception to this rule and made it in the same form, with very few changes, for almost one hundred years. The rebranding in 2005 was intended to make justice to the original taste. As long as the original blend stays the same, one doesn't have to worry that the taste will be modified. And the manufacturer will always sell at least one variety to remember everybody of the taste that made this brand famous.